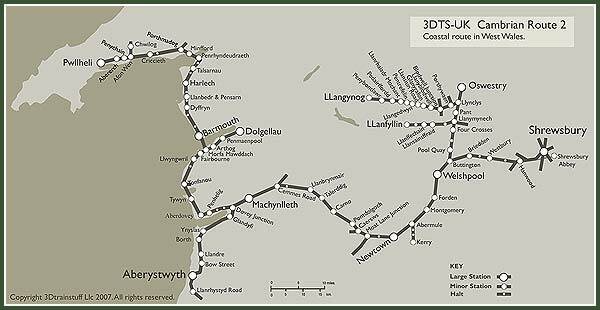 A MAP OF THE CAMBRIAN 2 SHOWING THE ENTIRE 200 MILE CAMBRIAN RAILWAY NETWORK. Thank you for choosing THE CAMBRIAN 2 ROUTE, we have now made ordering easier than ever. Just take a moment to fill out the form below, make sure that all of your information is correct, and that all of the fields are entered before clicking the submit button. IMPORTANT: ALL SOFTWARE DOWNLOADS ARE NON-REFUNDABLE. NO EXCEPTIONS. So please make sure you order only the products you want and do not click on the "SUBMIT" button more than once. **IMPORTANT** 3D TRAIN STUFF RESERVES THE RIGHT TO REFUSE SERVICE AND CREDIT THE TRANSACTIONS OF ANYONE USING OUR WEBSITE. All Contents © 2000-2016 3D Train Stuff - All Rights Reserved.